Chinese fried rice made with fragrant jasmine rice, carrots, peas, and scrambled eggs. This easy stir-fried dish turns plain white rice into flavorful grains lightly seasoned with soy sauce and tossed with colorful vegetables. I often use leftover rice for a quick and convenient meal. Fried rice is a Chinese food restaurant staple that’s always on the take-out menu. It’s hard not to eat every light and fluffy morsel. What makes the dish so tasty is the stir-fry technique that’s easy to tackle at home. Using this vegetarian recipe as a base, you can incorporate any mix-in’s or proteins you’d like to switch up the taste. Growing up in a big Chinese family not far from Oakland Chinatown, homemade fried rice at our house was a “clean-out-the-fridge” type dish, no recipe needed. My mom would use leftover rice from a previous meal and then add in some meat like diced ham, spam or char siu. Easy and delicious every time. Leftover cold rice is ideal to use because the grains are separate and cook easier in the wok. That doesn’t mean that a fresh pot of rice can’t be used, especially when the craving hits. It only takes about an extra 20 minutes to prepare. The key to fresh rice is allowing it to cool slightly before using. The cooling process can quickly be done by spreading the rice on a sheet pan at room temperature, or chill in the refrigerator for 5 to 10 minutes if you’re impatient like me. The rice should be cool to the touch before adding it to the pan. Fry the rice by lightly browning in a pan or wok. Stir-fry the onions, garlic, and carrots until tender. Make a large well in the center of the pan with the rice. Pour in the whisked eggs and scramble until small curds form. Soy sauce is optional but adds a savory flavor to the rice. Add green peas at the end to retain color and shape. I am guilty of eating the rice straight from the pan, often serving as dinner instead of just a side. Other ingredients to add to this recipe are shrimp (fresh or dried), tofu, diced chicken, Chinese barbecue pork, or diced bacon. For those on a low carb diet, cauliflower rice or broccoli rice are tasty cruciferous substitutions. A bowl filled to the brim with steaming rice, and bite-sized pieces of egg and vegetables bring maximum taste-bud satisfaction. My chopsticks can never move fast enough as I devour my first serving, with the hope that there’ll be a little extra left to scoop out from the bottom of the pan. Long grain rice holds its shape and stays separate when stir-fried. Jasmine is my top choice because it has a delicate and light floral aroma, not too sticky when cooked, and slightly dry in texture, making it easy to maneuver in the pan. Medium-grain like Calrose or brown rice can be used, but incorporate when chilled or day old as it is stickier. Make sure to always wash the rice before cooking to remove excess starches on the surface, which can cause clumping. 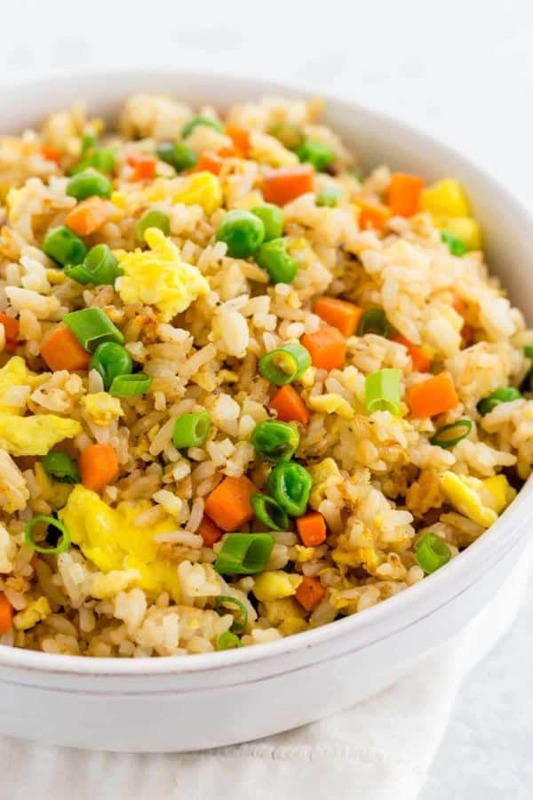 Chinese fried rice recipe made with fragrant jasmine rice, carrots, peas, and scrambled eggs. Put down the takeout menu and make your own! In a 3-quart sized saucepan, rinse uncooked rice with cool water until it runs clear, then drain off excess water. Add 2 cups of water to the washed rice. Bring water to a boil and then turn down heat to a simmer and cover with a lid. Fluff rice with a fork and allow to cool to room temperature while preparing the other fried rice ingredients. Heat a wok or large skillet over high heat. Add 1 tablespoon of vegetable oil, once hot add in the rice. Stir-fry the rice to evenly coated with oil, then spread and lightly press around the pan. Allow to cook for 30 seconds, then stir. Repeat the spreading and stirring every 30 seconds for 5 minutes total, to encourage some light browning on the rice. Make a large well in the center of the pan and add in 2 teaspoons of vegetable oil. Add onion, garlic, and carrots, stir-fry in the center of the pan for 1 minute, then mix with rice to combine. Make a large well in the center, add in 1 teaspoon vegetable oil and 1 teaspoon sesame oil. Pour in whisked eggs, allow to sit for about 30 seconds, then gradually stir to create small scrambled egg pieces, stir to combine with the rice. Add in soy sauce, stir to combine. Add peas, stir to combine, and cook until warmed through, about 2 minutes. Taste rice and season with salt and white pepper as desired. Garnish rice with green onions, serve immediately. For this recipe, 4 cups of cooked rice are used. To cool the rice quickly, spread on a sheet pan until it reaches room temperature, or chill in the refrigerator for 5 to 10 minutes. 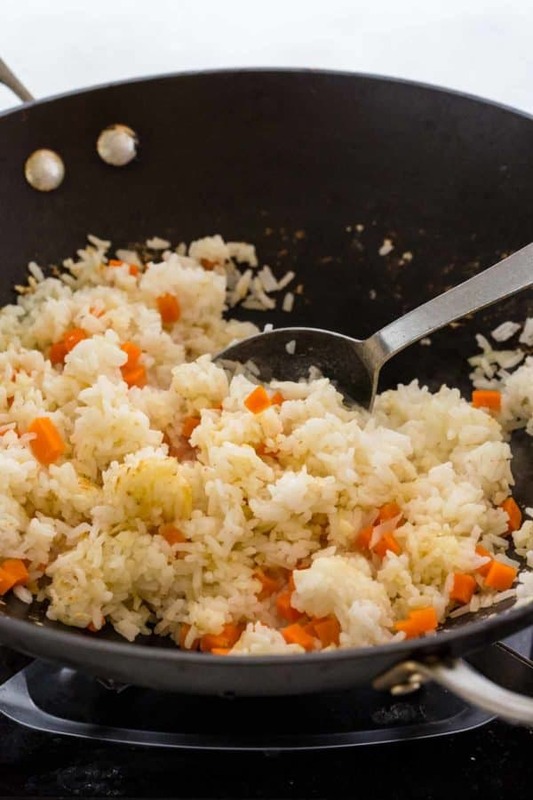 Leftover cold rice can be used, simply skip the freshly steamed rice cooking steps 1 through 6. Substitute 4 cups cooked rice for the 1 cup of uncooked jasmine rice. If using cooked day-old rice, break it into individual pieces with your fingers before adding to the pot. If larger pieces of the egg are preferred, cook them first, breaking into the desired size, transfer to a plate and reserve, then and add back to the end of cooking right before serving. Other types of rice can be used like long-grain, medium-grain Calrose, or brown rice. Just make sure that it yields 4 cups of rice, as each variety cooks up to different volumes. MAKE IT GLUTEN-FREE: Use gluten-free tamari or coconut aminos instead of soy sauce. Hi Jessica, I enjoy your recipes. I love food and do most of the cooking at home. I cook various cuisines, but mostly Chinese. I have a recipe that I have never seen anywhere in cookbooks. The recipe goes : hamburger meat steamed with lop chon and peas. I do this often as it is a favorite in my family. I’ve seen this recipe using pork or chicken, but never hamburger. For seasoning, I use such items as oyster sauce, or hoisin sauce, soy, garlic, ginger, cilantro. Thanks for sharing Ronald, it’s sounds delicious. I wonder if it’s something my grandma used to make, but I don’t recall the name. Lop Chong are Chinese sausages. Made it this evening as the recipe directs. Excellent results! A keeper. Thank you for your feedback Miblet! This is the recipe that brought me to your site. It was both delicious and quick. I’m eager to explore your recipes and LOVE the layout of your site. You have taken all the guesswork out of Asian cooking and give very clear directions and videos. Finally, the photography is stupendous! The easy fried rice recipe is great! Everybody in my family loved it. Also, do you have a vegetarian chow mein recipe? It would be helpful is you could post one. I do have a vegetarian chow mein! Just search “chow mein” in the browser. I was looking for a fried rice recipe that was easy and I came upon yours. I had all the ingredients and just made it. Yours was the only one that said I could make the rice and use it right away- all the others say you should use day old rice (kept in refrigerator over night at least) my problem is once I put it in the large skillet it immediately stuck to the bottom of the skillet. It became mushy. I made sure my oil was hot – I do not have a wok but used a large stainless skillet. It became stuck to the skillet and was really mushy, i continued to add all the ingredients and followed the recipe. Other than the fact the bottom was glued to the skillet, the rest was delicious and I just skimmed the top off, I am soaking the skillet now. It never did brown the rice but as for the taste, it was great. I did not burn the rice it just immediately stuck to the skillet. Thanks for your feedback Molly! Sometimes if there are starches on the rinse still, that causes it to be more stick when cooked. I rinse the raw rice until the water runs clear. You can also try spreading the rice on a sheet pan and refrigerating until its cool to the touch before using. Do you happen to have a nonstick pan you could use? Update from my previous comment! I did your recipe a second time and this time I cooled the rice like you advised. I spread it out and let it cool in the refrigerator! This time it did not stick to the skillet and it came out perfect – I loved it so much that I will make it every time I want fried rice. Its the best recipe I have found yet! The rice has to be cool for it to turn out best if you start with fresh rice. Thanks for the recipe! Thank you for the follow-up! Happy to hear that the cooling of the rice really helped with the stickiness. You rock! Hi Pat! I’ve updated the recipe, it is actually 8) 1 Tablespoon, 11) 2 Teaspoon, and 3) 1 teaspoon. Thanks! Hello! I wanted to ask you about using long grain rice in a rice cooker and cooking it the night before and then putting it in the fridge? I would assume this would work as long as the rice is fluffed \ separated before the stir fry process? I usually just add the rice and the water to the rice cooker but maybe you suggest adding something else as well?? Thank you so much and I can’t wait to try making this! Hi Jim- Yes, you can cook the rice in the rice cooker the night before, allow it to cool on a sheet tray before placing in the refrigerator. You can refrigerate the sheet tray covered, or put it in a smaller container. Then separate as you are stir-frying the rice. 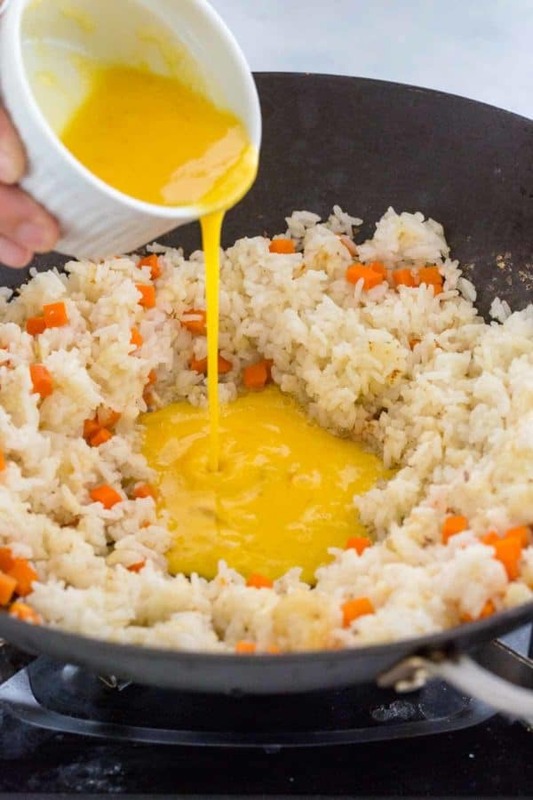 Hi – found your fried rice recipe and love it! I am diabetic so need to watch carb intake. I substituted riced cauliflower for rice, it is delicious! Thanks Judy for your comment. I would never have thought of using riced cauliflower for fried rice. That will certainly help my waistline.